Last week on Twitter, I asked you guys if you’d rather see a main course or dessert recipe for the upcoming Easter holiday. Of course, many of you vegan goblins said you wanted BOTH! Actually, the majority vote was for the main course recipe, easily by a 80/20 split. Does that surprise any of you? It’s interesting to note this because my most popular recipes (or should I say, the ones that are clicked on the most) tend to be dessert recipes. Maybe it’s the case that people enjoy drooling over pictures of desserts, but in reality, we tend to make more savoury, main course recipes. Well, let me tell you, this isn’t a dessert that you should just look at. You should make this now. And be sure to take a picture because they last much longer. That was the damage I did immediately after the photoshoot. HA! Imagine a cross between a peanut butter cup and a chocolate peanut butter torte, with a healthy, vegan twist. This is it! My obsession with this idea started when I came across a peanut butter cup recipe over at The Purple Spoon. I couldn’t get it out of my head for days! 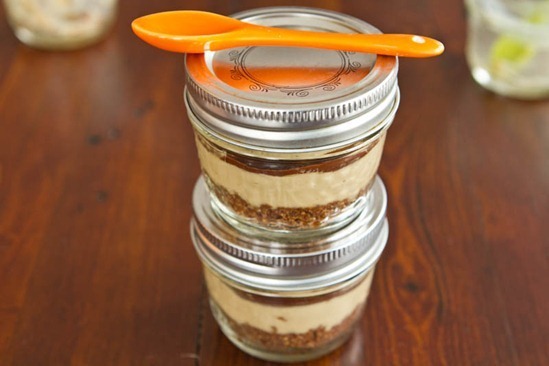 I wanted this dessert to be mini to keep the portion size in check, so I used these cute and portable 125ml mason jars. They worked like a charm! I picked mine up from Canadian Tire. 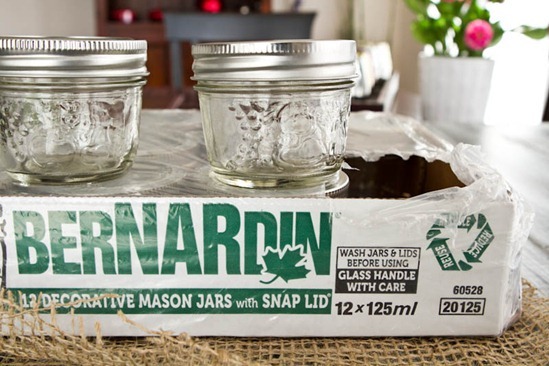 You can find different sized mason jars at many home hardware type stores, as well as Wal-Mart. 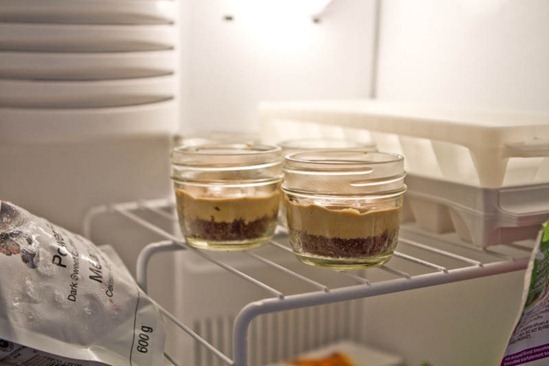 If you don’t want to use jars you can use ramekins, but the dessert won’t have nearly as much height to it. Or you can easily double the amount that goes into each dish. The first thing you do is make a chocolate graham cracker crust with graham crackers, maple syrup, coconut oil, and cocoa powder. If you don’t want to use coconut oil, you can sub in Earth Balance and you can also sub the maple syrup for another liquid sweetener. 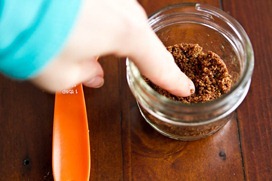 I added a couple tablespoons of the crust into 5 mason jars and then pressed it down with my fingers until even. For the second step, I whipped up the insanely creamy and buttery peanut butter filling. I feel all flustered just looking at the picture again! My goal for this filling was to make it high in volume, so I used silken/soft tofu to add thickness and body with minimal calories. It was my first time making a dessert with soft tofu and I was a bit hesitant (ok, a lot), but it worked amazing and I could not detect it at all. And place the jars in the freezer for about 30 minutes. Now go do some busy work or you will drive yourself insane peeking into the fridge every 45 seconds. I’ve been there…the minutes pass like days. After the filling sets, melt the chocolate and coconut oil and then spoon a teaspoon of melted chocolate on top of each. Now, quickly twist the jar all around to coat all sides with chocolate. Chill in the fridge or freezer until the chocolate sets. I prefer to enjoy it cold from the freezer, but I let it thaw for about 10 minutes first..if I can wait that long. If making homemade powdered sugar, add 1/2 cup of Sucanat (or brown sugar) into a high-speed blender and blend until a powder forms. Set aside, but leave the lid on as it needs to settle. 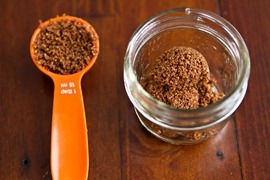 In a food processor, process the crust ingredients until crumbs are a bit damp. Add 2 tablespoons of the crust into each jar. Spread out evenly and flatten with fingers. Quickly wipe out the processor bowl. Now add the filling ingredients and process until silky smooth, scraping down the sides as necessary. Add 3 tablespoons of filling into each jar and spread gently with a spoon. Place jars into freezer, uncovered, for about 30 minutes to firm up a bit. 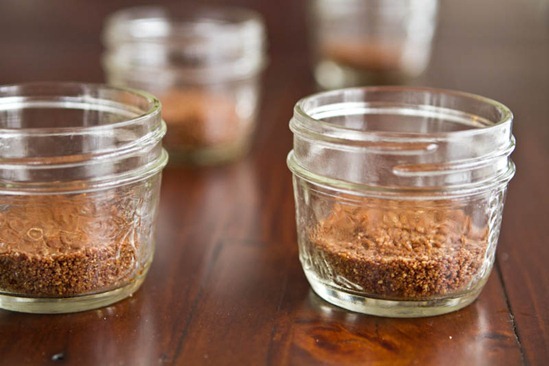 Remove jars from freezer and melt the chocolate on the stove-top or microwave. Spoon 1 teaspoon of melted chocolate on top of the filling. Quickly, twist the jar around to coat all sides. Repeat for the rest. chill in the fridge or freezer to firm up the chocolate or just dig in as is! You can also try using my homemade PB graham crackers instead of buying from the store. 1. What if I can’t have nuts? If you can’t have nuts, I suggest using sweetened sunflower seed butter as a swap for the peanut butter. You may also need to swap coconut oil for Earth Balance and be sure to check all other ingredients. 2. What if I can’t have gluten? For a gluten-free crust that works amazing (I even tried it myself), try using this pecan based no bake crust. Of course, double check all other ingredients to ensure they are GF. 3. What if I can’t have soy? That is a tricky one for this recipe. My first thought is to use banana (or banana soft serve!) because it’s sweet, easy, and blends super smooth. You may also want to reduce the sugar. 4. What if I don’t have coconut oil? Feel free to sub Earth Balance for coconut oil. 5. What if I don’t have maple syrup? Feel free to sub any liquid sweetener of your choice. 6. How do I make homemade powdered sugar? As I’ve seen on Lesley, Ashley and Katie’s blogs, it’s very easy to make homemade powdered sugar. Simply add Sucanat, brown, or white sugar into a high-speed blender and blend until a powder forms (you can also add a bit of cornstarch to it, but I didn’t bother to for this recipe). Allow it to sit in the blender for at least 5 minutes to settle. There tends to be a huge white cloud when you take off the lid, so it’s a bit messy, but it’s a great, natural swap for confectioner’s sugar so I’m not complaining too much. I didn’t measure how much 1/2 cup Sucanat made, so if you are using store-bought powdered sugar I would start with 3 tbsp and add to taste from there. Sucanat also gives the filling a nice golden tone. 7. What if I don’t have mini jars? Feel free to use ramekin dishes, but I suggest doubling the ingredients since ramekins are a lot bigger. Whew, am I chatty today or am I chatty today? Must have been that 6am hot yoga class…I’m bouncing off the walls here. This is such an interesting idea. I love peanut butter! Oh my goodness, these look amazing. Peanut butter + chocolate is by far my favorite flavor combination, so these are pretty much as perfect as a dessert can get, in my opinion. Can’t wait to try them out! I gave up chocolate for Lent and am eagerly counting down the days until Easter :) Also, kudos on making it to a 6AM hot yoga class! I think I was turning off my alarm in my sleep around that time, haha. I want to do this with Almond Butter! But sans tofu and lots of the other ingredients. It looks delicious but could also be made so much simpler for my allergies. So simple and so cute! tied with a easter coloured ribbon and this would make the cutest easter treat for guests! LOVE YOUR BLOG! could we do a crushed pretzel sprinkle topping? 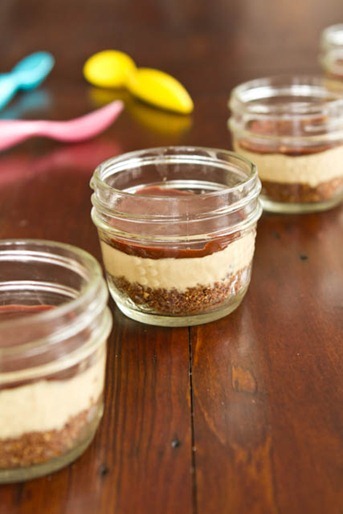 these look insane I love the combo of the graham cracker crust & creamy filling YUM! You’re a genius! Unfortunately my husband doesn’t like the chocolate pb combo, so that means I’d have to make and eat these all by myself. Sigh…tough life. How could it get any better!? I will definitely give these a try along with my little helpers in the kitchen. I’m not sure we’ll make it to the freezing stage as we may dip into it for important taste testing! These look so great!! Love the jars too. Oh man, I need to make this for my hubby ASAP. He loves chocolate and peanut butter together! Also, if you are interested in more desserts with Silken Tofu, you should try 101Cookbooks chocolate mousse. I made this for a bunch of non-vegans and they all asked for the recipe! Thanks for the link Shelly! I’ve seen quite a few blogs with a silken tofu pudding recipe…might have to try it out. If its anything as good as the PB one was…oh myyy. Wow those look to die for. They would be cute to send away with the friends/family who can’t stay for dessert. Tie a little spring colored ribbon around the jaw and voila! Instant party pleaser! I’ll be making theses for sure. My fiancé is a sucker for peanut butter, so I’m sure they’ll go over very well around here! I was hoping someone would ask that…I’m pretty obsessed with these mini jars. heh. Maybe a pie? oh. my. this is my idea of heaven. thank you! You did it again! Looks amazing, and I can’t wait to try them! Young Thai Coconut would be a great replacement for tofu as well! great idea! I’ve never used it before but now Im intrigued. Where do you get this coconut? I have never used tofu and it scares me. I would love another way to get the same texture. Oh but Angela, you didn’t answer my question!! The second photo is definitely my favorite. All the best things in the world captured in a little jar. Will try with banana soft serve, not a tofu fan..
Dang this looks so good….looks like the baby is allergic or sensitive to peanut butter or soy. I must test it out. Lovely dessert!!! Thank you for the inspiration! It was all I could think about for days…haha. Amazing! I have everything at the house and will be making these on good friday!! THANK YOU!! This looks absolutely amazing! I’m definitely trying this one time, I’m obsessed with peanut butter and chocolate! Great recipe! Avocado might be a good alternative to the silken tofu (mixed with agave and a little cocoa powder and peanut butter). hah that’s so funny! It’s so good, right? I love your idea of chia and letting it sit…I can imagine how thick it gets! Just pinned this, how you don’t mind. It’s too fabulous not to share! But chocolate and PB is amazing :) They look so adorable! These sound so good and the small mason jars are too cute. I think I need to make an almond butter variation…yum! Ooh each layer of that looks like heaven so I can only imagine what it tastes like altogether! I’m curious about the nutritional analysis on this but I bet it’s a lot lower cal than it looks, especially due to the soft tofu, as you said! Wowza!!! That looks SO GOOD! Such a cute idea! I love it! Graham crackers and pb is a childhood fave of mine! easy peasy, delicious, healthy, pnutbutterly and mini! LOVE IT!! Thanks! I’m speechless. That looks so delicious. I think I’ll just go for it – all the way and use a large jar instead! In the end, there will be fewer dishes to clean. holy monkeys. I need this NOW!. PB And chocolate is my FAVORITE! This reminds me of my favorite vegan bar at New Seasons… I think it is by Petunias Pies & Pastries… It has the gluten free crust (to die for) and then a thick chocolate slab over the peanut butter filling. oh my goodness – amazing. so am dying to try this! Oh my goodness! You had me at the title of the post. The pictures are beautiful and I have a feeling these portable peanut butter cups are going to pop up soon in my future! Thanks for yet ANOTHER amazing recipe! 6am yoga classes are the best…completely energizing!!!! This reminds me of something my grandmother used to make for my great-grandmother. The love of chocolate and peanut butter flows through my veins, too! You just can’t go wrong with that combination! I wonder if coconut whipped cream would work instead of tofu? You know that hard cream that settles at the top of a can of coconut milk? Probably a hella lot of calories and fat that way but I bet it would work. Taste… not sure! 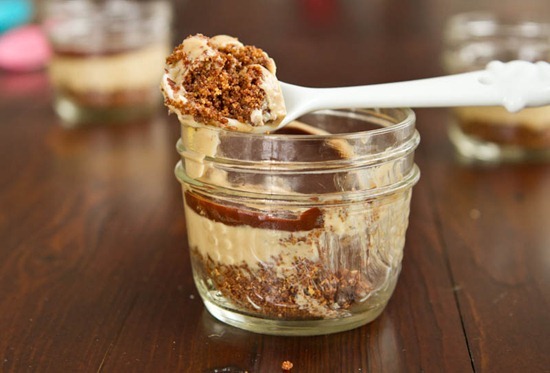 I am always looking for vegan dessert recipes, and I just LOVE peanut butter!! Can’t wait to give it a try. Mmmmm – those look heavenly! I love the mason jar presentation too. 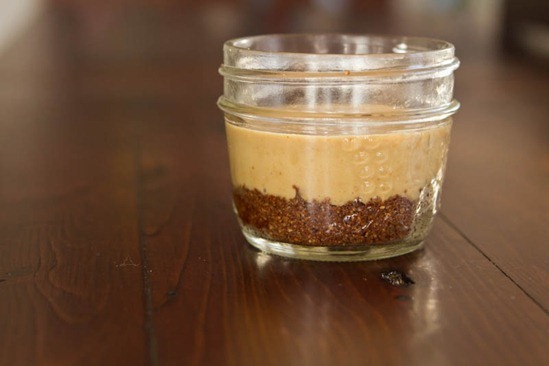 In all of your deserts that feature peanut butter, have you ever subbed almond butter? I see here you’ve suggested sunflower seed butter. I’ve been on a almond butter fix ever since reading several books that all suggest peanuts contain lots of mold and can be taxing on the liver. But this looks amaZING!!! I think I’ll try with PB anyway for a little splurge! Everything vegan in moderation, right?!? Thanks. Where did you find vegan graham crackers?! Also, instead of soy, people could use blended cashews to make like a cashew cream. another great idea re: cashew cream. It’s not easy finding vegan graham crackers, especially because most contain honey. I looked in about 4 stores for them! I finally found them in bulk, but I admit the ingredient list wasn’t the healthiest I’ve ever seen (containing glucose-fructose….blech). Next time I’m going to try making my own crackers and using it for the recipe. I’ve also heard that Health valley makes vegan grahams but I haven’t found them yet. This. is. GENIUS! I am definitely making these soon!! Oh wow, these look amazing! Chocolate peanut butter is my absolute favourite. I used to inhale Reese’s PB cups before I gave up dairy. I’m tempted to make these for a wedding favour! I will have to taste test a bunch first though, of course haha. Are you still planning on starting a running group? I’d like to get in on that if possible. I would also like to work up the courage to try hot yoga. I really have no excuse except my fear of feeling like an awkward newbie. I am thinking of trying Some Like it Hot… do you have a studio recommendation? Hey Melissa! I made a list for the running group, but since I injured my knee lifting a box I’m just waiting for that to heal until I start running. Sorry for the delay! Hopefully I can get it off the ground sooner rather than later :) You are on my list though. I tried SLIH yesterday and it was nice, but I hope to try other studios as well to get a feel for what’s out there. There are so many options! Anyways, I’ve been wanting to get some small jars to make mini pies in and now these. Thanks!! 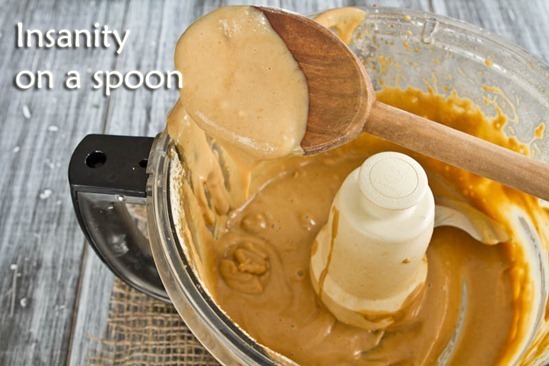 I’m making this today…using PB2 instead of peanut butter. I love PB2, all the protein, none of the fat. Nothing wrong with good fat, but I like my desserts to be guilt free. I can use the extra calories of fat in my entrees! Holy deliciousness! These look amazing! I love when things are made in small single servings. It helps me with portion control because this is one of those things where it wouldn’t be hard to put back a whole batch!!!! Great recipe Angela! I had NO idea you could get these jars at Canadian Tire! I am stopping on my way home! Thanks for posting where you got it! I am on a mission lately to find coconut oil which seems to be an elusive product right now. Coconut oil can be tricky to find. I’ve found that it’s usually in the natural food section of the grocery store. Otherwise you can find it online or in health food stores. You can never go wrong with the chocolate peanut butter combination. I would definitely have to make these right before I was leaving the house. Otherwise I would probably just be staring at the freezer waiting for them to be ready. Wow! I can’t wait to try this! And thank you for being so kind and giving so many other substitution ideas. 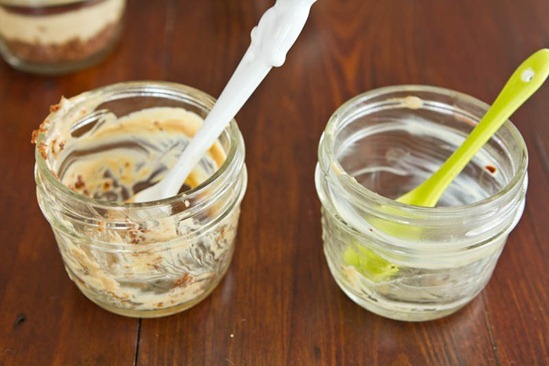 I always use those little jars to bring vegan overnight oats to work or wherever. Perfectly portable! And hot yoga at 6am? You go, girl! I can’t wait to be healthy enough to get back to my yoga classes – I miss them so! This looks amazing! Thank you so much for telling us how to make it GF. I can’t wait to try it! Yum! These have been bumped up to the top of my “must make” list! I’m going to make them with soy nut butter instead of SSB – it’s my favourite nutless butter and I’ve heard that it actually tastes slightly similar to PB! How perfect for a party! Seriously, they look delicious–perfect combination of chocolate and creamy peanut butter. I’d love to simply eat the pb filling! This looks absolutely amazing — I wish I had some now. I need to buy some ingredients, but I have a feeling it’s going to be delicious when I get there! I love the jar idea. Would be a perfect little gift! 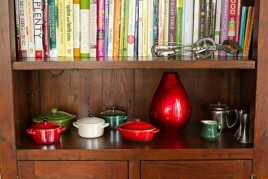 Are those your new antique painted boards you were talking about (in the photo w/ the food processor & PB)? I want nothing more than to eat a giant jar of peanut butter cup right now. It’s been one of those days! These look incredible, Angela. giant jars…now you’re onto something! This looks amazing!!!! I have no words, I’m speechless!! My day seriously just got a million times better after reading this recipe! Thanks for the allergy info and modifications too. I will be making ASAP. Thanks Angela!! oh goodness me! These little guys look delicious! I definitely want to try making these but will have to use the subs for the crust and filling. I’ll let you know how they go! I love that you were able to take a crazy delicious-looking yet unhealthy dessert and make it better for you and yet still crazy delicious-looking. You are a genius. Can’t wait for your book to come out!! I don’t know what it is about Mason jars, but everything is more to eat out of them!! 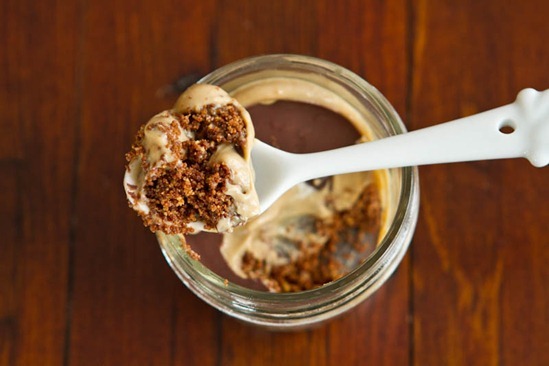 Dessert in a jar – I love it! Looks delicious! The idea of small jars is great… portion control! Mason jars are THE best thing ever. ONLY container I ever use for food storage! Walmart even carries 1.9L ones sometimes…you can store so much quinoa or steel cut oats in one. oh…and next time I see dbf for the weekend I’m totally making these. Amazing! looks so delicious!! thank you for adding the alternative ingredients at the end! What kind of hot yoga do you do? oh yum! love mini mason jars :) love the presentation of these too!! yay! Cant wait to try this. i had a several month streak of cooking the majority of my meals, mostly vegan. and working out regularly, but the past 7-8 weeks have fallen off the wagon a bit due to trying to settle in to a new job! but im noticing how much less energy i have and how “blah” i feel sometimes lately, and i really think its because of my diet and excercise not being regular right now. I need to start enjoying healthier versions of dessert again such as this and revert to making all your yummy main courses again! I love the addition of the questions at the bottom…no need to try and figure out the answer myself and risk ruining the glorious dessert! OMG-I will make sure to make it tomorrow!! !Looks delicious. Hey Angela where do you practice yoga in Oakville? I share your fluster on looking at these pictures. I now have a voice in my head demanding that these be made. I sense it won’t be quiet until I obey! They look amazing! 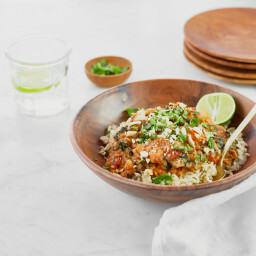 Gotta try this one soon :) your food photography is getting amazing day by day ! Thanks for all the posts .. This is a GENIUS idea! I love it! Glad you tried the tofu. I was afraid to use it in dessert the first time too. I used it to make a raspberry chocolate ‘cheesecake.’ I didn’t tell anyone what was in it (only after they devoured a slice). Everyone was shocked :) It works so well because it gives it a creamy consistency. I can’t wait to try this! I agree with whoever it was above that said it would be a great dessert send off! This is perfect desert this coming Easter Sunday. My family will love this, that’s for sure. We all love peanut butter. This is a must-try recipe. Thanks for sharing! Gosh!! This looks so yummy! I’m thinking about this non-stop since yesterday night…. I will have to make those today or tomorrow for sure. Thanks! 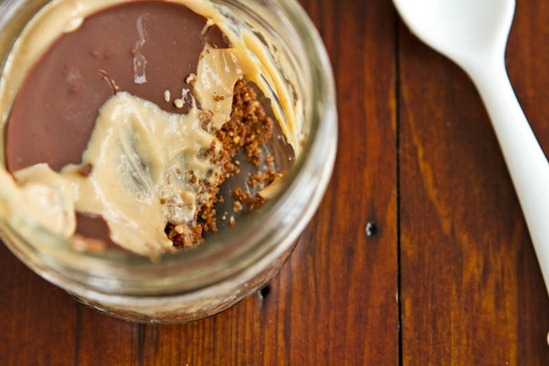 Wow, you have taken peanut butter and chocolate to a new level..this looks so amazing!! Is 1 jar 1 serving bc I don’t think I could stop myself! I actually had a dream about these peanut butter cups last night. Holy Moly Deliciousness. You inspire me Angela! So grateful for your blog! I would like to try this dessert. What can I substitute for the silken tofu?? Hey Sabrina, please see my suggestions in the post. Other commenters suggested young thai coconut or cashew cream too. YUM! No other words are necessary! Made this tonight. Made it with the suggested nut crust. Didn’t put the chocolate on top because my husband doesn’t like chocolate. He ate three servings. Guess he liked it. So basically you made heaven in a jar? Lent can’t end fast enough! heh sorry to tease… :) Hope you like them if you end up making it! OH MY! im completely out of words for once in my life. Ive heard that is fantastic! These look amazing. I cannot wait to try them. This recipe comes just in time for Easter. Thank you Jamie, I greatly appreciate it! I made these last night!! DELICIOUS! I was curious about carob powder. I was getting ready to buy some online and I saw Bob’s Red Mill only sells “Toasted” Carob Powder, do you think there is some difference because it’s “toasted”? i called the Bulk Barn where I buy my carob powder and the lady said it doesn’t say that it’s toasted….so I guess I am buying un-toasted carob powder! Im not sure how much the taste differs. It might be worth googling to see if there is any info on it. Oh wow this looks so yummy! Love peanut butter and chocolate together! This looks AMAZING!!!!!!!!!!!! i CAN’T WAIT TO TRY IT! Angela I LOVE your blog!!!!!!! Thank you so much, I appreciate your kind words Desiree. Ohhhh my gosh this would be a perfect dessert to make for my sister’s bday this weekend!! Thank you :)! Peanut butter is my husband’s favorite food. Thanks for the recipe! Angela, I want to make this for a work party but don’t have mini jars. Do you think the proportions would work in a 9×9 dish or a pie dish? Our would I have to double it? This is honestly one of the most delicious and fun looking desserts I have seen! I think you are right, we all love to look at desserts, and would make them if we had more time, but more often than not, the savory dishes get made because we all need and expect dinner every day. I am definitely going to try sometime over the next week and will post about my results! I know what you mean, I was hesitant to taste it too! Made these last night and they were awesome! Also, the mini mason jars are adorable. I was so happy to have an excuse to buy them. I bribed my husband with the promise of peanut butter and chocolate to get him to take me to the hardware store for the jars. He’ll do just about anything for the PB/chocolate combo! 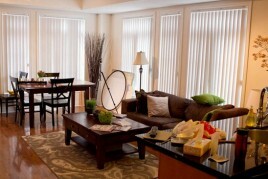 Wow – I was traveling for work and missed your blog for a few days so I was doubly excited to come back and find this! You can bet that I’ll be making this pdq. Thanks for the continued fantastic recipes. I’m glad to hear that..have a wonderful weekend Susan! Hi Meagan, I recently heard that coconut was debated about being classified in the nuts category since so many people have allergies. Do you know if that’s true? I made these yesterday and they were awesome! I loved them. I think next time I might put some crushed nuts in the crust :) Fantastic idea. So happy to hear that Jenn! the silk tofu was new for me and what a wonderful surprise! So I just stumbled on to your blog looking for something vegan and sweet with the stuff I’ve got in my pantry. So I don’t have cute little mason jars but I DO have a tonne of plastic Easter eggs. Guess what’s going in those tonight? That’s right, mini-peanut butter cups! Thank you. I just had to make these immediately with whatever ingredients I had at that time. So for graham crackers, which we do not get here in India(atleast they are not easily available), i used cookies, for tofu i subbed cottage cheese and my oh my… i just loved them. I was literally licking the dish clean. well, there were a couple of things i needed to improve on like making the base a little bit harder. I am going make them again today :D.
I will surely try these with tofu sometime. Love Love Love them. yum! Oh man these look good! I don’t have any small mason jars but I do have the big ones;) Just kidding..kinda. A wonderful hit at our Easter brunch. Thank you! I made these desserts for our Easter dinner and they were absolutely scrumptious! My kids thank you!!!! Amazing! I just made these little cups and I gotta tell you, Angela, you really rock!! I’ve made several of your recipes and they are all wonderful and have been added to my recipe book. I”m passing along your vegan goodness to my friends. Thank you so much! Thank you Tania, so happy to hear that! just wanted to tell you that I made these last week and they were incredible! Great recipe!!!! I just finished making this recipe and my filling was much thicker – how did you get it so creamy (and spreadable with the crust??) more almond milk? Did you use soft or silken tofu? If so, then Im not sure, but yes you could try more almond milk. The thickness of the PB might impact things too. I made these without the crust last night for my boyfriend’s birthday. They are amazing. I blogged about them and linked to you. hah nice…glad you enjoyed them! Ok! Gotta say, I just made those little guys (not quite the same recipe, I changed it a little because I did not have graham cookies) and OMG!!!! This sis SOoooooooooooo worth it!!!! I’ll post something about it tomorow and will linked it to your original recipe. Thank YOU it’s so frikkin’ yummy!!!!!!!!!!!! 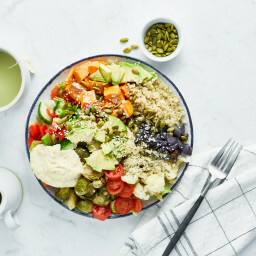 Curious if the tofu be substituted with anything? I’m not supposed to have soy? A couple days after I drooled over this post, I saw those little mason jars in the store and knew that was a sign I had to make them. Well, I’ve made them twice! My family LOVED them, and I love that the tofu lightened them up a bit. 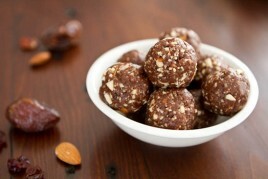 Adorable and delicious and healthful – how can you ask for anything more? Hi Barb, thats great to hear! Thanks for letting me know, I always appreciate it. These are DELICIOUS. I made a double batch today in a muffin pan lined with parchment liners. They are perfect!!! These lil bad boys are firming up in the freezer right now… Instead of 1/2 cup plus 2 Tbsp graham crumbs I just used 1/2 cup and added 2 tbsp ground flax. Didn’t have coconut oil so just a splash evoo…. The tofu mixture tastes amazing… Light and creamy and dreamy, everything tofu isn’t.. You have amazingly done it again. Thankfully the jars come in a 12 pack so I’ll have to double the recipe next time, sigh. ground flax is a great idea! Angela, I’ve made this 3 times now – addicting!!! Husband, boths sons (4 & 2) devour this dessert before I can say seconds anyone? I’d say it’s their fave hands down. I could simply drink the filling, haha! I didn’t have almond milk and used unsweeted coconut milk which worked fine. I also bought lite silken firm tofu in error which worked. I’m wondering if you will be coming out with a coconut cream pie version soon, please!!!!!!!!!!!!! I can only imagine what you would come up with. Something simply divine as usual! These are to die for. And the perfect serving size. The PB rocks. And I was inspired to wing it with some pineapple and coconut next. They’re freezing now! Ice “cream” for summer. Yippee!! And no tofu taste at all. Just made these using frozen banana instead of tofu, and they’re dreamy. Used much less sugar–about 2 Tbsp total. Thanks for a great recipe! I made these for our Fourth of July BBQ. Made 16 jars, wrapped red, white & blue ribbon around the lids and never got to have one, they were gone before I could get a jar. Thank goodness I kept “testing” the process. ;) Best part is I am the only vegan in the family so 14 people ate them not knowing they were eating tofu and found them absolutely delicious! The only change I made was a thicker chocolate shell. Thank you for yet another yummy recipe! Wow carol that is such a cute idea!! What lucky family members ;) Great call on the thicker shell too! These look YUMMY!!! I may have missed it somewhere, but how many jars does this recipe make? I may have to make these fot a get-together and want to know how much I need to multiply the ingredients by. I was thinking about making this using cashew/almond creme instead of the silken tofu. I just found packages of ready-made organic cashew and almond creme at my local Hyvee and it’s pretty thick and should work well. I may have found a substitute for tofu in this recipe, cashew and almond creme, which you could make at home of course, but I also found it locally packaged under the name MimicCreme (organic, gluten free). The texture I’d imagine is similar and it’s actually really solid with the peanut butter mixed in, even without freezing or refrigerating. Made this recipe yesterday-and its AMAZING! My husband who has the biggest sweet tooth loves them even more than me! 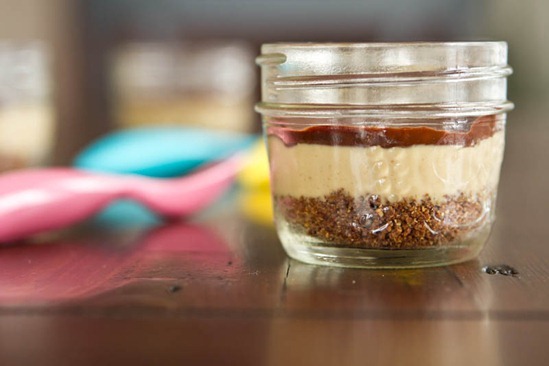 I’m going to try substituting the PB with Tahini and adding some sugar/gluten free PB flavour and in my graham cracker crust (which i used coconut flour) I will add Chocolate flavour Stevia-that way I don’t have to add chocolate on the top. Then I can top it off with some raw crushed up nuts w/ a hint of Himalayan salt….make this a even more “guilt free” high protein dessert . Thank you for sharing this recipe!!!! They look so delicious! 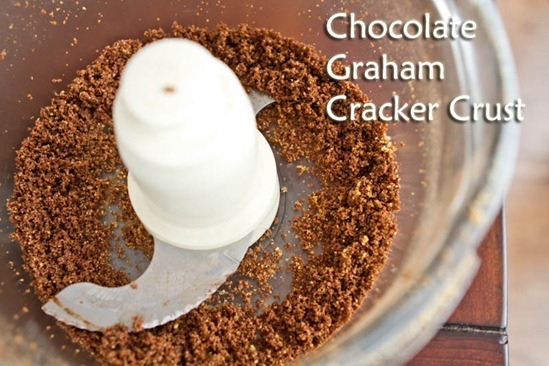 I am going to pick up some graham crackers next trip to the store and make this!!! This look so good! Discovered this recipe featured in Shape magazine while searching for lunch & treat ideas for a bike camp. Definitely on the list of possibilities. I do have one question… would you have a recommendation for substitution for the silken tofu? I try to avoid soy products, where obvious… what about cashew cream? I have found such inspiration from so many of your recipes (now, on Pinterest too)! Just delightful! I just finished making these for my Christmas party. The mini version I made for myself to taste test was really good. I cut the sugar in the filling by a little more than a half and substituted the tofu with some Tofutti cream cheese, because that’s what I had on hand. I assembled the peanut butter cups in two ounce shot glasses (a perfect serving size, in my opinion, considering how rich they are), and they will no doubt go quickly at the party. Thanks for the recipe! The only thing I wish I had done was put it in the fridge and not the freezer. My graham cracker crust and the chocolate on top were rock hard (and I only put it in the freezer for about 10 minutes after I drizzed the chocolate on top!) I think it would be delectable room temp or only slightly chilled. Love the idea of these!! Just wondering if you have the caloric value for them? Has anyone tried freezng these? They look bomb and I plan on making them this weekend, but don’t need to eat all 5 in a row!!!!! I am so excited to make this recipe. I don’t have a scale to weigh the tofu. Silken tofu boxes usually come in 12oz sizes in the US. What do you think 200gm is the equivalent of in oz? I’m also thinking of doubling the recipe. 200g is equal to 7.05 oz. hope this helps! Thank you so much! It does help. Umm… Thank you! We tried it tonight and the whole family went yum! 5 Stars from my daughter ;-) It reminded me of reese’s pieces except way tastier! I only made the filling with a few changes: 2 Tbsp powder sugar, ~ 2 Tbsp maple syrup, no milk to make up for the liquid sweetener. Excellent recipe and a perfect treat! I feel like I’m late to the party! 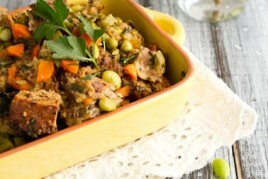 I just saw this recipe in your top of 2012 and 15 minutes later I was scurrying to the grocery store for tofu. 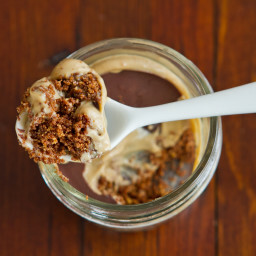 Since I’m allergic to chocolate, I tweaked the recipe just a wee bit…cinnamon graham cracker base with a hint of agave, a teeny bit of cinnamon in the tofu pb mousse, and then a dollop of apple chia jam! Amazing! I don’t even eat sweets and I thought this was delicious!!! Everything I have made on this site is soooooooooooo good! You are a terrific cook. I just recently gave up meat. This site has been a God sent!!! that’s it. i’m stopping at the store on the way home and buying a food processor, graham crackers, and little jars. and then i’m making this. and then i’m eating this. intake. Thanks for your inspiring website!! No Im sorry I don’t have it calculated yet. enjoy! Made these a few weeks ago and they were to die for! I have just began my journey into clean eating and I was terrified at the idea of never eating a chocolate peanut butter cup again….these are even better! I froze a few, as I cant eat them all myself at once, but when I had one last night, either the crust or chocolate tasted funny….im wondering if its the coconut oil that doesn’t freeze well? I have just finished making my second batch…these are incredible!!!! This time I added some small peanut bits into the base crust- can’t get enough of those peanuts! This makes going vegan easy – thank you! Your recipes and blog have helped me and my husband increase our vegan meal plans. Hey!! This looks delicious!! My favorite thing on the earth is the combo of chocolate and peanut butter–so you can imagine I’m practically salivating! Lol. But what’s is the calorie content for one of these?! Any round about figures for me? I’m on my own weight loss journey and love finding new recipes for all occasions to try out! Would be greatly appreciated! Just tried this recipe and its delicious! definitely a keeper! These look divine! Do you think the extras could be stored in the freezer until you’re ready to eat (maybe taking them out an hour or two before to thaw)? Hi Julia, I haven’t tried freezing them, but I can’t see why it wouldn’t work. If you try it, please let us know. Enjoy! I like to make these in silicon muffin liners, then freeze them and eat them like ice cream sandwiches!! I just made it and brought it to a dinner :) it was delicious! We had family visiting this weekend, so made these as a special treat…without telling them about the tofu. Dessert was a smashing success!! They requested I make them again when we get together in April. I think next time I won’t press the crust quite so firmly into the bottom of the jar because it was a small struggle to get it out. Be we poked and prodded until it softened up because we didn’t want to miss out on one sweet, creamy bite. When I fessed up about the tofu, they didn’t care one bit because the result was so delicious. These look absolutely amazing! For about how long can we refrigerate it for? A few days? Tried it and I feel in love instantly…It’s so good! I was wondering if I could freeze the peanut butter cups in a jar overnight rather than just for 30 minutes. These were a big hit even for our friends who don’t normally eat these healthier versions of desserts! Love them & love the presentation in the jars! Looking forward to making them again this time with the Pecan crust for my daughter who is following a gluten/soy free diet. Of course seeing your recipe for Chilled Double Chocolate Torte: The No-Bake Version, where I found your crust recipe, will be something I will also make for her since she is a chocoholic! Love checking for other great recipes to try! Should I have to press the water out from tofu before use? These don’t just look good, they are fantastic! Less than a 1/2 hour putting it together. I had to distract myself by mopping to leave them alone for chilling. It was a sweet reward for doing my chores though. Can’t wait to serve them to company. I only had extra firm silken tofu, so I added some coconut milk with it to the blender. I dare anyone to tell it’s made with tofu. Creamy, Rich, Chocolate & PB. What could be better? I just made these last night! Didn’t change a thing, and since i did it so late they are all in the freezer waiting to be christmas eve dessert. Although Im wondering if I should put them in the fridge a few hours before hand so they soften up a bit. Tops on or off? Thanks for the great recipes! Has anyone tried using medium firm tofu instead of silken? I couldn’t find organic (my preference for soy products) silken. Just made these – I can’t explain how good they were … just awesome! As with all of your recipes, they are good for you and taste amazing. Thank you for sharing your great recipes!! We made these last night. My daughter ate three and I ate the other two! They are delicious! Thank you for your wonderful recipes! Once again, I am not disapointed, on the contrary, I’m in love! This is so good, simple and healthy (for a dessert!). Thank you so much for sharing your talent with us. Angela, you’re my favourite chef and I talk about your recipes to… a lot of people! You’re amazing. I loved this recipe. So easy and will now be a dessert staple! Thanks for sharing. I found these were a bit sweet for my liking. I wonder what they would be like without refined sugars (or swapping maple syrup instead of the brown sugar). Also, I would 100% suggest these be put in the freezer instead of the fridge. I found that in the fridge, they were more of a pudding vs the freezer which gave them a firmer texture. If you do freeze them, allow them to sit at room temperature for about 10 mins before serving for easier scooping!